for the first time in Great Britain! a passionate interpreter and a charismatic performer. Cyprus President Nicos Anastasiades has expressed his regret over Turkish Cypriot leader Mustafa Akinci`s decision not to attend their meeting on February 23, in the framework of their UN-led negotiations on the Cyprus problem, and his readiness to continue the dialogue at any moment. The Cyprus government announced on Wednesday that it was informed by the UN that due to Turkish Cypriot leader`s refusal to attend, the meeting between Anastasiades and Akinci will not take place. The Turkish Cypriot leader walked out of a meeting last week, in the framework of the UN-backed negotiations on the Cyprus problem, shortly after it began, because the Cypriot Parliament took a decision to commemorate in schools, by form of a reference, the 1950 referendum, favouring “enosis”, union with Greece. Although President Anastasiades has stressed that the decision does not in any way mean a change of policy on the solution and in spite of the fact that the National Council issued a statement reiterating this, Akinci demands withdrawal of the House decision. Cyprus has been divided since 1974, when Turkey invaded and occupied its northern third. Anastasiades and Akinci have been engaged in UN-backed talks since May 2015 with an aim to reunify the island under a federal roof. UK Minister for Europe Sir Alan Duncan has repeated the British government’s position that it stands ready to accept any negotiated security framework for a reunited Cyprus, avoiding, however, to engage in a direct discussion on whether there should be any place for third country guarantees. Sir Alan welcomed the Cypriot leaders’ commitment to resuming political level talks next month. “We are keen to maintain momentum and stand ready to bring negotiations to a successful conclusion,” he added. David Burrowes, another north London Conservative MP, asked the minister whether he agreed with the view from the APPG for Cyprus members who visited the island last week that the best hope for a solution is the dedication and courage of both Cypriot leaders freely negotiating and the realisation from the communities that the status quo of a divided Cyprus is untenable, and also that Turkey needs to “get that” when it comes to security and guarantees. In his response Sir Alan Duncan commended the leaders of the Greek-Cypriot and the Turkish-Cypriot communities for their “good faith and dedication” and for working “tirelessly” towards a solution. “There are other ingredients that are necessary, such as the cooperation of the two main countries next door, Greece and Turkey; and of course finally, and this is very important, successful referendums within each community,” said the Minister for Europe. Join us on Friday 24th March 2017 for an unmissable Greek party at Club Azure. LGR DJs Sooty & Andreas Demetriou will be on the decks mixing up all the latest and greatest in Greek and English music. They will be fusing all the best Modern Laika, Greek Club, Greek Classics, English club anthems, RnB, Garage & Bashment. Doors open at 9pm and we’ll keep you dancing till 3am. For table reservations call Club Azure on 020 8363 1150. This event is strictly over 18’s. No ID, no entry, no admission. To buy tickets for this event please visit our events page: Greek Vibes tickets from Skiddle. President of the Republic of Cyprus Nicos Anastasiades called on the Turkish Cypriot leader to abandon his accusations and return to the negotiating table in a constructive manner, with a view to reach a solution in Cyprus that would meet the expectations of both communities. Speaking at the Presidential Palace, after Thursday`s meeting between himself and T/C leader Mustafa Akinci, President Anastasiades expressed sorrow for the outcome of the meeting. During their short meeting in the framework of the negotiations for a Cyprus solution, which began at 1000 in the morning local time, Anastasiades and Akinci elaborated on their positions as regards a decision taken by the Cypriot Parliament on Friday to commemorate the 1950 Enosis Referendum in schools. President Anastasiades stressed that while the discussion was taking place in a friendly and constructive manner, after a short break as a result of a disagreement between the Greek Cypriot side and the UN, the Turkish Cypriot delegation left the meeting without any reason. The President said that the Turkish Cypriot leader`s claims as to what happened during today`s meeting are not the real facts and expressed his belief that UNSG`s Special Advisor for Cyprus Espen Barth Eide, who was present at the meeting, will set things straight. Replying to a question, the President expressed the view that the stance of the Turkish Cypriot side during today`s meeting had been decided in advance. He emphasized that the Greek Cypriot side and himself remain fully committed to the achievement of a viable and functional solution of the Cyprus problem, and the continuation of the dialogue as agreed before the UN Secretary General on the 12th of January 2017. The President said that UNSG Envoy Espen Barth Eide tried to convince the Turkish Cypriot leader Mustafa Akinci to return, however he was uncompromising. President Anastasiades explained that during the meeting Akinci reiterated what he publicly has stated in relation to the concerns of the Turkish Cypriot community because of the decision taken by the House of Representatives, to commemorate in schools a referendum held in 1950 in favor of Cyprus` union with Greece. He pointed out that he explained to Akinci that these concerns are not justified and he referred to the unanimous statement by the National Council taken on Monday, which clearly underlines that the objective is not the union with Greece and is not of course the partition. He also repeated that the Turkish Cypriot side cannot doubt the will of the Greek Cypriots for a solution. President Anastasiades said that the unanimous statement of the National Council speaks of the commitment to a solution that is fully compatible with the resolutions of the UN General Assembly as well as the Security Council resolutions. He also repeated that he will not allow anyone to doubt or question our side’s sincere will for a solution that will be accepted by both communities. The President said that during today’s meeting he referred to various incidents that disregard the sensitivities of the Greek Cypriot community, pointing out that he never sought to stop the dialogue, he did not ask the Turkish Cypriot leader to assume any responsibility or to correct the decisions taken by the political parties in the Turkish Cypriot community. Furthermore, the President said that he highlighted the progress that has been achieved and the fact that it is important to focus on continuing the negotiations in order to address the remaining differences. President Anastasiades added that in today’s meeting he pointed out that one should not seek excuses in order to avoid the assumption of responsibility that Turkey bears or to allow Turkey to raise demands that do not concern the interests of the Cypriot people. He went on to say that such approaches undermine the whole process and are not consistent with is publicly proclaimed. The President called on Turkey once again to contribute to solving fundamental issues of the Cyprus problem that have to do with the concerns of the Greek Cypriot community. He said that inappropriate or unnecessary decisions or statements give pretext to Turkey or the Turkish Cypriot community and they are exploited in order for them to avoid taking any responsibility. The President of the Republic also went on to say that the Greek Cypriot side remains fully committed to finding a viable and functional solution and to the continuation of the dialogue as agreed before the UN Secretary General in Geneva on January 12, 2017. He urged the Turkish Cypriot leader to return to the dialogue and show constructive spirit so that they can achieve a comprehensive solution that meets the expectations of both communities. Invited to comment on a statement by the Turkish Cypriot leader that it was the President who first walked out of the meeting, he said that the journalists themselves are witnesses to what happened as they were informed from the Turkish Cypriot media that Akinci left the talks, while he (the President) arrived that the Presidential Palace at least half an hour later as he was waiting for Special Envoy Eide to convince Akinci to return to the negotiating table. Asked about the UN stance and Eide’s efforts, the President said that Eide made an attempt to create an environment of understanding and while referring to the concerns expressed by the Turkish Cypriots, he suggested that they are maybe wrong or right. He explained that he responded to that saying that it is not accepted for him to doubt the will and intentions of the Greek Cypriot side, especially having witnessed after two years, the stance of the Greek Cypriot side. The President said that after that, he asked for a small break and while he was outside, the Turkish Cypriot leader and his team walked out. He went on to say that not even Eide himself realised what had happened, he remained in the room and he did not go out to greet the leaders and their teams, as he always does. He pointed out that Akinci’s statements do not respond to the real situation, adding that he wishes to be really careful in what he says as he does not want to exacerbate the situation. He also expressed his hope that Eide will state the real facts, adding that he will also brief the UNSG on the incident and the accurate facts. He also spoke about events that are celebrated by the Turkish Cypriots that offend the Greek Cypriots. President Anastasiades also said that never before an issue was brought up about the celebrations for April 1st, which mark the anniversary of the Cypriot anti-colonial liberation struggle of 1955-1959 and represent the desire and objective for union with Greece. He pointed out that if our wish is the reunification of our country, we must abandon any pretexts and focus on what is important and crucial in order to give our country hope. The Republic of Cyprus has been divided since 1974. Anastasiades and Akinci have been engaged in UN-led talks since May 2015 with a view to reunite the island under a federal roof. For the first time in London, on Friday 3rd March, London Greek Radio are hosting a spectacular evening. Enjoy a traditional Bouat styled evening in a chilled and relaxed atmosphere. Entertaining us on the night are the talented; Aggeliki Darra, Katerina Neocleous, Tony Panayi, Ploutarchos Manolessos & Nikos Ntintas. Join us in the bar of the Cypriot Community Centre, Earlham Grove, Wood Green. Let’s have a drink and listen to the live music and have an amazing evening. You can even sing a long too and really let your hair down. There will be drinks and nibbles available at the bar. This event is sponsored by: C. Michael & Co Accountants, Delphi Food Products, Nikos Transport, Anastasia Lodge & Autumn Gardens. The Eurovision Semi-Final Allocation Draw carried out on 31st January, at the Column Hall of Kyiv City State Administration, in Ukraine, officially launched the start to Eurovision season. The Cypriot and Greek entry performers have been drawn to sing in the First Semi-Final of the Eurovision Song Contest 2017, airing on Tuesday 9th May live on BBC4 at 8 p.m. GMT. We last visited Kyiv in 2005, that proved absolutely one of the best Eurovision song contests ever, with Elena Paparizou’s song ‘My Number One’ which won the Eurovision, bringing the only Greek victory in the competition. The Semi-Finals will span Tuesday 9th May to Thursday 11th May concluding with the second semi-final, on that occasion. The Eurovision Final will go out live on Saturday 13th May at 8 p.m. GMT to be held at the Kyiv International Exhibition Centre (IEC). Cyprus and Greece is amongst 18 countries, conclude the first semi-final. How it works really… The Top 10 qualifiers who pass the round in each allocated semi, with 50:50 Tele-voting, and professional jury points. The semi-heats producing our lucky 20 qualifiers on both Tuesday and Thursday will be entered in the live final. The 37 Semi-Finalists have been allocated into six pots, based on historical voting patterns as calculated by the contest’s official tele-voting partner Digame. 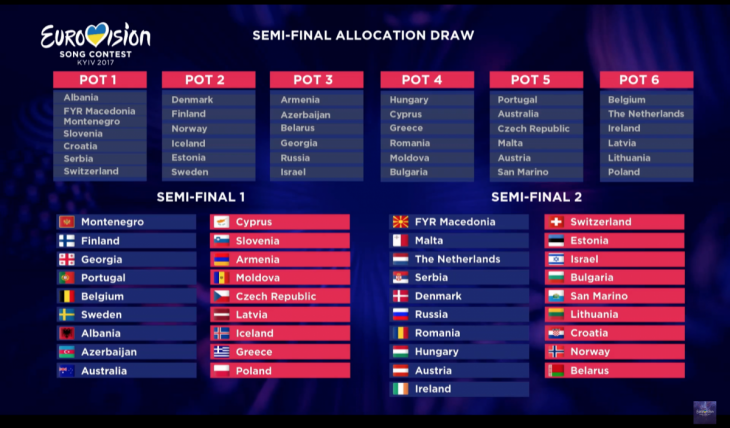 Drawing from different pots helps to reduce the chance of so-called neighbourly voting and increases suspense in the Semi-Finals. The UK, Spain, Germany, Italy, France, and host’s Ukraine thanks to Jamala’s winning song last year are direct finalists. The Big 5 has that upgraded status, as Eurovision’s biggest financial contributory members to the European Broadcasting Union, organisers of the Eurovision. Hovig aka Hovig Demirdjian will represent Cyprus in Kyiv, internally selected by the CyBc broadcaster. He is a Cypriot pop singer with over 10 year’s music career; he went all the way to the live shows of Greek X-Factor in 2009, and has never given up on his quest to represent the Cypriot flag at the song contest. He will sing our Cypriot tune called ‘Gravity‘, composed by Swedish producer Thomas G:Son. His song has a Eurovision feel and potentially radio-friendly hit song, suggests the song-writer. The official video is due to be released in March and we can’t wait to get our hand on it to share it with our listeners on LGR and through lgr.co.uk. She is signed to the Panik Records family, with a substantial volume of pop hits. This year’s Greek trio is dubbed the ‘dream team’ surely working very hard to come up with a competitive song. Dimitris and Fokas, have a long illustrious run in the song contest with many Top 10s including Sakis Rouvas, to Sergey Lazarev, Russian entrant in 2016’s Eurovision Song Contest, finished Top 3 on finale night. The viewers in the United Kingdom are able to vote for their favourites in the first semi-final, airing on BBC 4, so too, Italy and Spain. Meanwhile, Germany, Ukraine and France are voting in the second semi-final of Eurovision on the Thursday evening. This year’s ‘Celebrating Diversity’ theme will define Kyiv Eurovision welcoming 43 countries, to the annual music event. Executive Supervisor of the Eurovision Song Contest, Jon Ola Sand said: ”The notion of celebrating diversity builds on last year’s theme of ‘Come Together’ and is at the heart of Eurovision values: it is all-inclusive and all about countries around Europe, and beyond, joining together to celebrate both our common ground and our unique differences, as well as the love of great music”. The running order will be determined by the producers of the show and approved by EBU’s Reference Group in mid-March. A cross-party delegation from the All Party Parliamentary Group for Cyprus recently visited Cyprus to express the support of the British Parliament for the ongoing negotiations to reunite the island and its people. The delegation was led by APPG Chairman, Sir Roger Gale MP and included Rt Hon Theresa Villiers MP, David Burrowes MP, Stephen Hepburn MP, Steven Paterson MP, Matthew Offord MP and Baroness Massey. The delegation was accompanied by Federation President, Christos Karaolis. The delegation met with President Anastasiades to discuss the progress, as well as some of the crucial issues still to be resolved in the negotiations to reunite Cyprus, as well as the ongoing Brexit negotiations. In the meeting, President Anastasiades thanked the parliamentary delegation for their longstanding friendship and encouraged them to continue their support for Cyprus. He went on to express his strong desire for a solution to reunite Cyprus, despite the challenges faced. The delegation also met with the President of the House Representatives Demetris Syllouris, the Greek-Cypriot Chief Negotiator Andreas Mavroyiannis, members of the House Standing Committee on Foreign and European Affairs, as well as the Mayors of the Occupied Municipalities. The APPG delegation welcomed the progress made in the current negotiations and acknowledged the legitimate concerns expressed over some of the remaining open issues including security and guarantees, refugee property and territory as well as the funding and implementation of a solution. The delegation also discussed the issue of the Missing Persons and Enclaved both with the Presidential Commissioner Mr Photiou as well as the House Standing Committee on Refugees, Enclaved, Missing and Adversely Affected Persons. The delegation committed to continuing to vocally support Cyprus in the British Parliament and raising the issues discussed and concerns expressed with the British Government and in Parliament. Chairman of the APPG, Sir Roger Gale MP (Conservative) said “There are clearly very significant issues that still have to be resolved but the benefits to both communities when an agreement is reached are enormous. Both sides have shown great political courage and goodwill. We hope that Cypriots will be given a chance to negotiate a settlement, without external influence, that will gain approval in referendums”. APPG Vice Chairman, David Burrowes MP (Conservative), said “At this crucial time in the negotiations we came to Cyprus as British Parliamentarians across parties and Parliament to show our support for a solution. We were struck by the dedication and courage being shown to reach a settlement. We also recognise the challenges on security and guarantees and need for the UK to do all it can, particularly in its relationship with Turkey, to support an independent reunited European nation free of Turkish troops”. Stephen Hepburn MP (Labour), said “It was an honour to visit Cyprus at this crucial time in its history. The briefings we received from the highest levels were extremely informative. Despite the challenges, I am most impressed with the commitment to do the best thing for all of the Cypriots across the whole of this beautiful island by delivering a solution that secures the return of refugees, resolves the issue of the Missing Persons and meets the security needs of both communities through Cyprus’ membership of the EU and UN”. Baroness Massey (Labour), said “I found the APPG visit to Cyprus frank and open. It was clear that the current window of opportunity in the negotiations between President Anastasiades and Mr Akinci is crucial. Much progress has been made in the negotiations, however it is clear that Turkey now has a crucial role to play. We will continue to offer our full support in Parliament”. Matthew Offord (Conservative) said “This is a momentous moment in the history of Cyprus and one that is vital to the future of the island. Separation of the two communities has continued for too long and now is the time for a solution to be agreed. President Anastasiades and Mr Akinci have to be applauded for their bravery in instigating and persevering with the talks and I urge them to continue and not be distracted by others, who have an interest in maintaining the status quo. There is clearly further work to be undertaken in order that an agreement – which is supported by both Turkish and Greek Cypriots – can be presented in the form of a referendum. This is a once in a generation opportunity and during our visit I emphasised that the United Kingdom will undertake any action considered necessary in order that Cyprus can, once again, be a united island. The President of the National Federation of Cypriots in the UK, Christos Karaolis, said “I welcome the continued support of our Parliamentary friends, especially at this crucial time in the negotiations. Significant progress has been made over the last two years, however it is becoming clear to all that the key to reuniting Cyprus, and resolving these outstanding crucial issues, lies in Turkey. Anachronistic guarantees and foreign troops have no place in a reunited Cyprus”. He went on to say “President Anastasiades continues to have the full support of UK Cypriot diaspora”. George Mazonakis, one of the biggest stars in Greece, is coming to London for the first time for a special show on February 28th. The multi-platinum singer has experienced profound success throughout more than 20 years of his discography and live performances. He put himself in a continuously changing and evolving process concerning his personal style and his repertoire choices. He has always been known for his crystal clear opinion about his aesthetic directions, his sheer professionalism and the simplicity of his beliefs. It seems that is all about a singer which is hard to compromise in the stereotypical categories that already exist in the Greek music industry. George’s temperament, unique interpretation and innovative views have changed the way of nightlife, with very successful appearances at famous nightclubs in Athens. London-based Microtone Productions is happy to welcome George and his 10-piece band to London, for the first time in his career, for a special show at KOKO on February 28th. Tickets are available via the Ticket Web website, click here to purchase yours. Advance online tickets are £35 or you can purchase yours on the door for £40 per person.